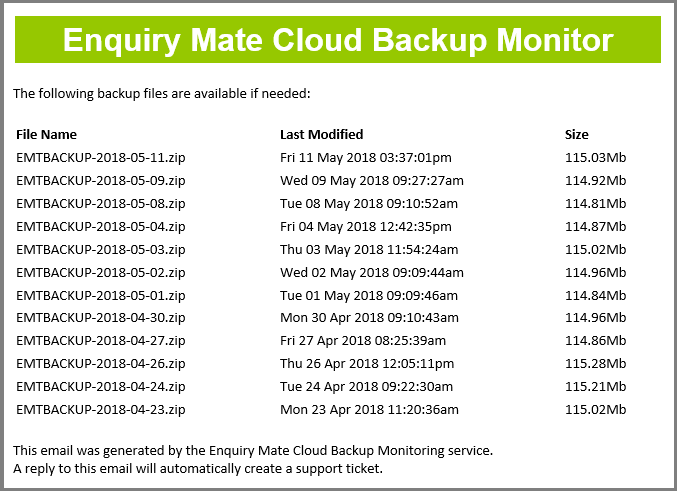 Enquiry Mate includes a cloud backup option for your main database and documents, images, export files and attachment files to our own cloud server. The backup ZIP file is password protected to provide an additional security. The basic backup service is provided at no extra charge, but has a limited storage allowance. How many backups this storage allowance will cover depends on the size of the database and files. Even better is that the standard and cloud backup; and the start-of-day processing can now all be done in the early hours of the morning to save you waiting when you start your day! This option only requires you to have a computer running at that time, whether it's a 24/7 server or you just leave your desktop PC on overnight. We can set up Windows Task Manager to run Enquiry Mate in a special mode at a fixed time of the day (usually between 12am and 6am) on one or more days of the week, and it's all done by the time you get to work the next morning. Provide your details to receive more info or make an enquiry!